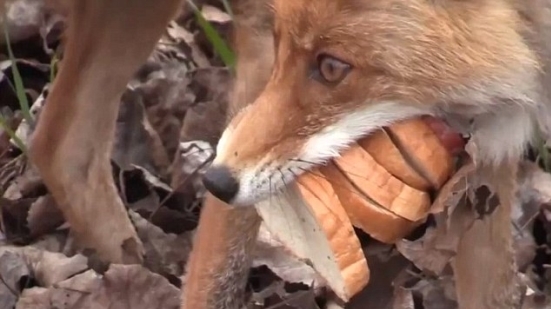 A fox in the Chernobyl Exclusion Zone stunned a radio crew when it assembled a sandwich before their eyes. The video was captured by a Radio Free Europe team who had pulled over in a restricted part of the Ukrainian city. While filming, the team were greeted by a fox, who approached them after descending a set of steps. Coming right up to them, the rather gaunt looking fox showed no signs of fear and almost stood waiting for food to come its way. Obliging the fox – which may have never seen humans before – the radio crew gave it some meat and a few slices of bread. Initially the fox ate the meat on the floor before him, but then began making preparations for later. Chernobyl was the site of the most disastrous single nuclear event in the world’s history. The city was evacuated in 1986 owing to a disaster at the Chernobyl Nuclear Power Plant when a reactor exploded. Responses to "A Wild Fox In Chernobyl Making His Own Sandwich. (Video)"